A bride should look and feel her best, said Ariel Meadow Stallings who wore a green dress on her big day. (CNN) -- Instead of trying to fit a certain mold, Ariel Meadow Stallings cut up a lime-green prom dress she found on eBay, and paired it with an iridescent blue corset. After all, it was her wedding day. She wanted to look and feel her best. "And that means wanting to wear the color you feel best compliments your skin tone and your hair," she said. While most brides aren't ready to walk down the aisle in anything more colorful than ivory, bridal consultant Susan Rogers said the wedding industry is slowly changing its tune. "In the last 10 to 15 years, everything went from white to ivory," Rogers said. "I think they figured out that everyone really didn't look good in white. ... Nobody orders white anymore. It's kind of a faux pas." And though lime green dresses like Stallings probably won't be popping up in bridal boutiques this season, designers have begun playing with colors like blush, ice blue, gray, latte -- a member of the beige family -- and even red. "People are starting to open up their minds a bit," Rogers said. "It takes a certain bride -- usually a second wedding. They've already done the white, traditional gown. They don't want to feel like a first-time bride." Susie Collins wore a royal blue dress the second time around. Collins was 21 when she married the first time. "My mother planned it. ... It wasn't me. I was just going along with tradition," she said. "A lot of people get caught up in that ... and then it's not a happy day for them." In the first half of 2010, the average cost of a wedding increased 21.9 percent to $23,867, according to WE TV's wedding report. Some of that money goes for the traditional wedding style. "Being here in the South, people are still very, very traditional," said Rogers, who works at the Atlanta, Georgia, boutique, Impressions. "There's huge pressure in what mom says." But a lot of young brides "are just looking for something non-traditional," she said. One bride who didn't see herself in "cookie-cutter-land" is Carolyn Gerin. 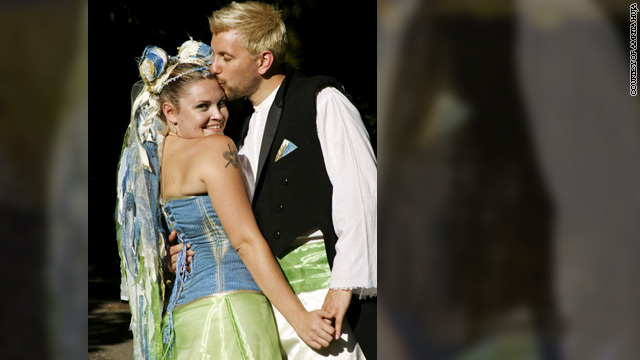 In fact, Gerin saw herself as the "anti-bride," which also happens to be the name of her book series and website about "tying the knot outside of the box." "[White] is universally hard to wear for so many body and skin types," she said. "And the average American bride is older now. ... The whole 'I'm a virgin and I'm wearing white' [thing] is kind of silly now." Gerin, who paired a silk and chiffon, midnight blue wedding dress with a black coat, said being an anti-bride isn't "just about dressing up and being different. It's about channeling your lifestyle. ... And if you really want a super-traditional kind of wedding -- it's all about you." Of course, there's no rule that says a wedding needs to fit into one category or the other. "Most of the people we've worked with take tradition and do it with a twist," said Natalie Bradley of brideattraction.com. "A lot of people like to embrace tradition to an extent because people are comfortable with it, but they want to make it theirs." Bradley said one bride reached that happy medium by wearing a white dress during the ceremony and changing into a red dress for the reception. There are other options for brides who don't have the means to purchase more than one gown. BreeAnn Gale of Pink Blossom Events said she's had clients who've chosen to add color to their wedding gowns in the form of sashes or bows. "You see it more with the bolder brides who want to stand out more," she said. But for Stallings, who was inspired to write a book -- "Offbeat Bride" -- and launch a website after saying, "I do" on her own terms, it's all about staying true to oneself. Even if it means wearing a lime-green wedding dress, she said. "It's less of a rejection of tradition, and more an embracing wanting to have your wedding reflect who you are," she said. "That can involve wearing colors." Stallings said she's seen people standing in a white dress on their wedding say, thinking, "I don't even know whose wedding this is." "An 'offbeat wedding' isn't about being reactionary or rebellious or a rejection of something," Stallings said. "It's picking up a wedding magazine and saying, 'this isn't me.' "